Jacqueline Toppin - Does Housing Care About The Shutdown? As long as we're talking about government shutdowns that last a few weeks, past precedent is highly informative, but the longer the current shutdown continues, the more we'll be in uncharted territory. This is especially true for the housing market. The only relevant comparison in the past 20+ years is with the government shutdown of 2013. Unfortunately, any interesting conclusions we might draw from that example are greatly limited by 2 key issues. The first issue, of course, is the length of time the shutdown lasted--specifically October 1st-16th. Moreover, government employees at the time were reasonably confident that the shutdown would be resolved fairly quickly. As such, they were less likely to allow paycheck uncertainty to affect home-buying decisions. The bigger issue is that another event greatly overshadowed any potential impact from the shutdown. The "taper tantrum" (a period of rapidly rising rates following the Fed's decision to "taper" the bond buying that had been doing such a great job of keeping long-term rates low) was still in full swing. We often minimize the extent to which rising rates can hamper home-buying demand. Indeed, it often makes good sense to do so! For instance, consider late 2016. Interest rates had risen sharply following the presidential election, yet existing home sales went on to hit their highest levels in more than a decade by the end of 2017. Sometimes, however, rates matter. The more severe the rate spike, the more of a surprise it is, and the longer it lasts, the more it can impact real estate. Timing plays a part as well. 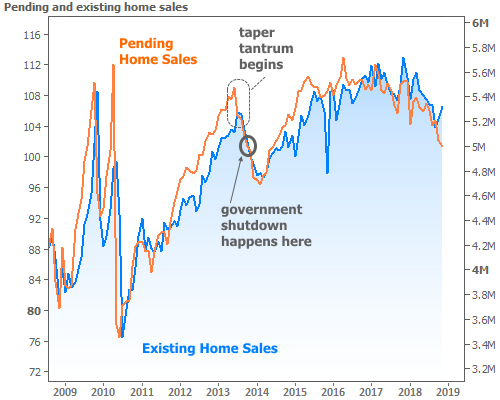 In 2013's case, home sales had been rising at their fastest organic pace (meaning, there wasn't any artificial "help" from things like the credits in 2008-10) of the recovery--fast enough that the market may have been looking for an excuse to level-off for a few months. The taper tantrum offered that excuse, so the government shutdown was lost in the shuffle. In the current case, things are a bit different. This time around the government shutdown hit during a fairly decent recovery in interest rates. It will give us a much better chance to see which one matters more. The only catch is that housing sales numbers for the time frame of the shutdown won't be out until later this month, and the most meaningful numbers won't be out until February or March. In the meantime, this much can be known: the shutdown will increasingly affect government employees. Even though they will receive back pay, the delay in that income will cause cash flow issues for many households. While that's a very big deal for those households and the associated real estate transactions, it's unlikely to have a major impact on home sales data. There is also some uncertainty as to the approach lenders will be taking with respect to approving loans for government employees and verifying their income. Lenders understand these borrowers will eventually be getting paid, but they'll need game-plans in place in the (hopefully unlikely) event it takes months for that to happen. Those game-plans will vary by lender and may change as the shutdown persists. In a few days, this will be the longest shutdown ever, and the industry will be facing certain challenges for the first time. 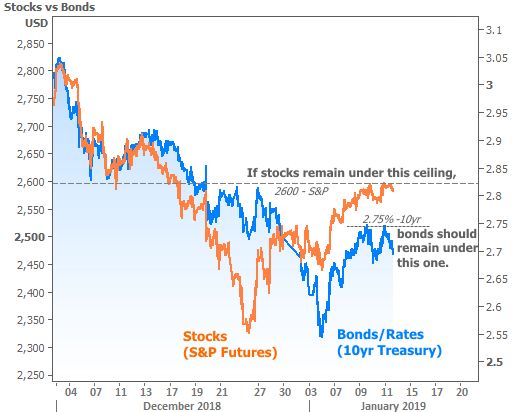 In financial markets this week, rates were able to find a ceiling as the stock rally stalled. Stocks and rates don't always move in unison, but they've often done so since the start of Q4 2018. There were two key economic reports this week with ISM Non-Manufacturing data coming in weaker than expected on Monday, but perhaps not as weak as investors were prepared for based on last week's ISM Manufacturing report. Rates moved higher as a result, but leveled off shortly thereafter. Friday's tame inflation data didn't compel rates to jump back up to recent highs. Next week brings several important reports and housing-related updates, or rather, it would have if the government were open. While the Bureau of Labor Statistics is funded (giving us the jobs report and this week's inflation data), the Bureau of Economic Analysis is not. As such, next week's would-be headliner, Retail Sales, won't likely be seen. The same goes for the New Residential Construction numbers for December (due out next Wednesday). We will, however, be able to get a read on building sentiment in January via the NAHB Housing Market Index. This is one of the earliest possible glimpses of the shutdown's impact on housing from a data standpoint (unless, of course, you count the fact that the shutdown is preventing other data from even being released! ).